Ready to kick those plastic disposable razors to the curb? Whether you are going zero waste or simply on the hunt for natural shaving options, switching to eco friendly reusable razors is a great start. Enter the long lasting safety razor! While shaving with a safety razor requires a little practice, it is nothing to be intimidated by. Your skin and hand simply needs time to grow accustomed to the method. 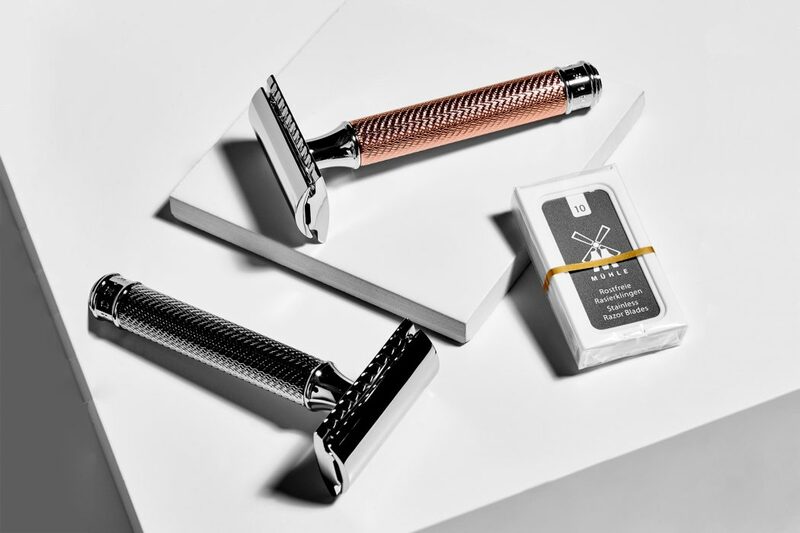 To get started, read on for an easy step by step guide on how to shave with a safety razor. Safety razors are one of our favourite kinds of eco friendly reusable razors. Unlike modern blade systems, the head of the safety razor does not move. The blades are replaceable by unscrewing the cap. This reduces waste and provides a long lasting razor. We like to use the Muhle Safety Razors, which are made of corrosion-resistant brass and chrome plating, making them a more sustainable option when compared to their disposable plastic counterparts. They are designed with a closed head to hold a classic blade that you reuse and replace when dull… And just happen to come in a very covet-able Rose Gold! The following is a guidance for facial hair and beards but can easily be applied to shaving legs, underarms or any other area with a safety razor. Moisten your face and neck with warm water. Lather the area thoroughly with your desired natural shaving products like a moisturising shaving gel or organic shaving cream. We recommend the Agent Nateur Holi Shave Oil, a light-foaming shave oil made with soothing calendula and chamomile to prepare the skin for a smooth, close shave. If you’re a sensitive skinned green beauty, Fair Squared Shaving Oil for women is good prep to help avoid pimples and skin irritation from shaving. For men shaving their face, apply the Muhle Shaving Cream which allows the double edge blades to slide over skin more easily. Make sure the razor head and handle are firmly attached to each other, but only tighten the screw to the extent that it can be unscrewed without much effort. Hold the safety razor at an approximately 30° angle to your skin. When shaving facial hair, start with the cheeks. Let the razor to slide over the skin, applying gentle pressure. With these eco friendly reusable razors, always shave in the direction of hair growth. Go with the grain, not against it. When shaving the neck, stretch the skin tight with your free hand. Do not panic if you get small cuts or grazes on your first couple shaves. Once you have familiarised yourself with how to use a safety razor, you will rarely make any nicks and scratches. If you are a practised shaver and ready for an ultra clean shave, try this: Slightly loosen the handle by ½ a revolution to increase the angle of the blade. This is great for getting into those harder to reach places. Make sure you tighten the handle again before continuing with the rest of the shave. When shaving, make sure you have moistened the immediate and surrounding areas with warm or hot water before beginning. Use an organic shaving cream or natural shaving oil to create a loose lather. Apply your selected natural shaving products in gentle strokes and massage into the skin. Wait for one or two minutes to allow them to take effect. Always shave hair using a sharp blade without applying too much pressure. Make sure to rinse freshly shaved skin with fresh water. After shaving, apply an organic after shave balm, like the Fair Squared After Shave Balm. This will help refresh, cool and soothe skin to prevent redness and irritation. Follow with an organic facial oil or natural moisturiser to seal in moisture.